Buddy Holly, Bob Dylan, Eric Clapton, Kurt Cobain. Those A-list musicians have all rocked out, some with pyrotechnics, on guitars made by one company steeped in Southern California history. 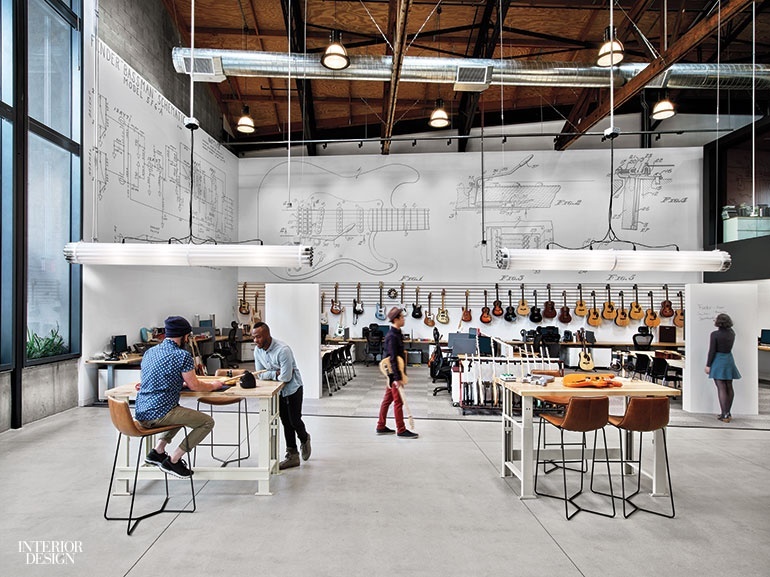 Founded by Leo Fender in 1946, Fender Musical Instruments Corporation still makes many of its elite guitars, by hand, in the city of Corona, between Los Angeles and San Diego. 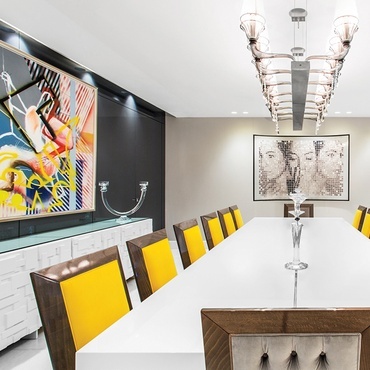 Yet the corporate team, the designers included, had been headquartered in Scottsdale, Arizona. Executives, now led by CEO Andy Mooney, deemed it was high time to move to L.A.—epicenter of the musical and digital scenes. Rapt Studio, with its expertise in the entertainment and technology realms, made it all happen. 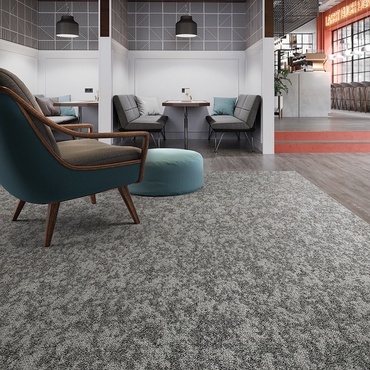 Flooring for an office area is epoxy. Photography by Eric Laignel. View the slideshow for more images. 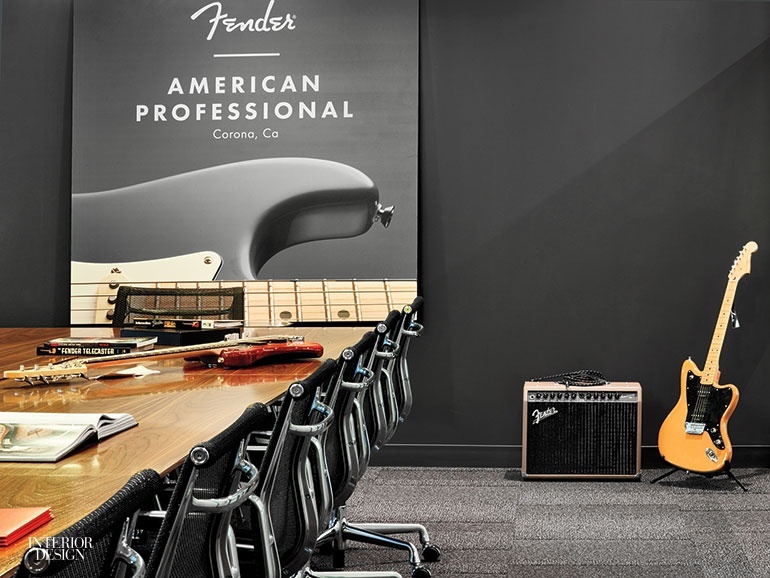 Fender’s new HQ is actually two offices, in separate structures. 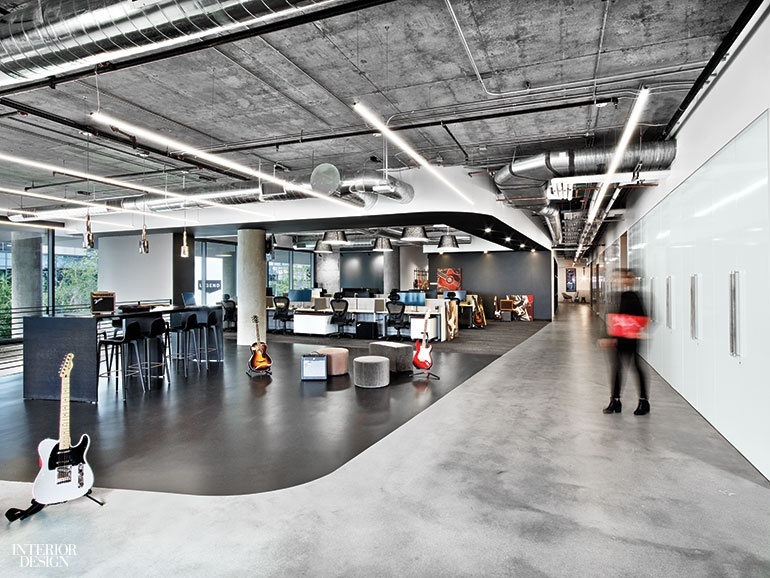 One building is a glassy mid-rise in which Fender occupies 24,500 square feet on the ground and second levels. There’s an additional 8,600 square feet down the hill in the other building, affectionately dubbed the Bungalow, which looks as if the sound stage standing on the site since the 1940’s had merely been cleaned and updated. “It just seems old,” Rapt senior designer Andrew Ashey explains. 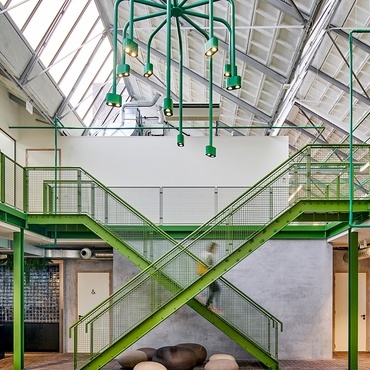 “It’s actually almost entirely new, built to resemble the old studio.” Only a few architectural elements, such as the wooden bow trusses, were retained. In the coffee bar, Jean Prouvé chairs meet Lluscà Design Barcelona tables. Photography by Eric Laignel. View the slideshow for more images. Here’s how the scenario plays out. 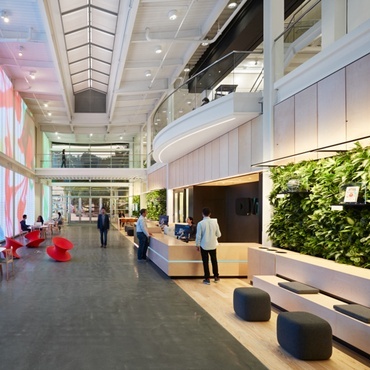 On arrival, everyone enters through the mid-rise building, its reception area boasting a feature wall of company-related words, dates, and shapes carved out of foam—an artsy introduction to the subject at hand. In the far corner, he punched through the concrete slab to make way for a staircase. 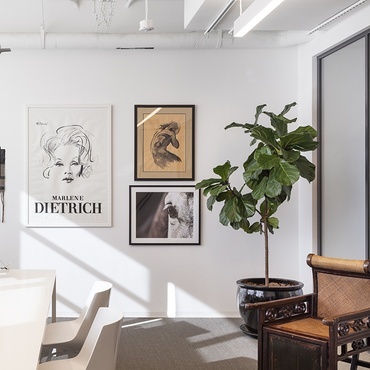 On both levels, he mapped out the office zone as a fluid interplay of open workstations, private offices, and meeting spaces, some enclosed and some not. Outside Mooney’s office, with its stuffed-animal armchair by Estudio Campana, a corridor wall is lined with guitars. A typical guitar body’s combination of pale and dark wood inspired the duality of the color palette. For instance, the reception desk has a base in blond oak veneer and a top in solid walnut. On the wall behind, Fender’s logo stands out against black paint. 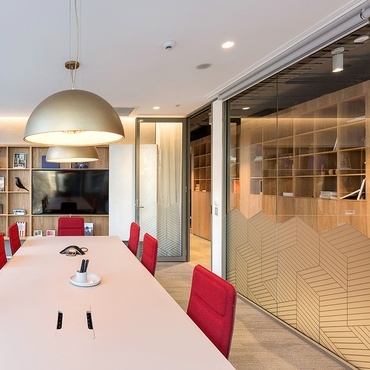 The boardroom contains chairs by Charles and Ray Eames and a table by Fig40. Photography by Eric Laignel. View the slideshow for more images. However, the same cannot be said of the design studio in the Bungalow. From the mid-rise, a side exit leads to a walkway between the two structures. Then the door to the Bungalow opens not to its ground level but to the mezzanine, giving a bird’s-eye view of a mural spanning two opposite walls. Naturally, it’s line drawings of guitar parts. Dozens of actual instruments-in-progress hang on the bars that run parallel across one wall, like the black lines of a musical score. Nearby, height-adjustable worker-maker tables allow the designers to experiment with their kits of parts. More tables and conventional workstations are grouped to either side. Each group is dedicated to a particular product type: one for electric guitars, another for acoustic, a third for amps, etc., through the whole Fender range. The same setup carries through to the mezzanine. 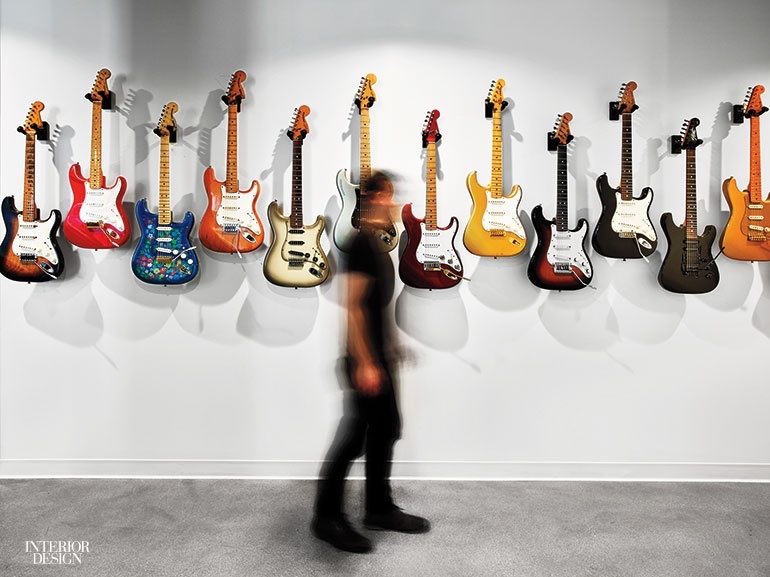 The CEO’s personal collection of electric guitars hangs in a corridor. Photography by Eric Laignel. View the slideshow for more images. Directly below the mezzanine’s L-shape overhang is an informal sound studio, where staff and visiting musicians can play to their hearts’ content, and the pantry, its banquette backed by channel-upholstered faux leather in a rockin’ red. 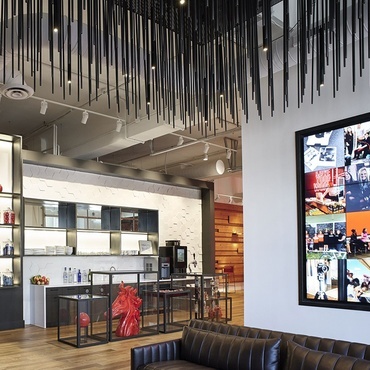 Partly screening the pantry from view, a black-painted partition supports a row of light boxes showing oversize portraits of Jimi Hendrix, the Red Hot Chili Peppers’s Flea, and other Fender-playing legends. In front of the partition, lounge furniture functions as a setting for parties. Performances also take place back in the mid-rise. The stage is the black-floored spot at the base of the stair, between reception’s sitting area and a couple of cases displaying “exploded” guitars, suspended on wires. Performers tend to be up-and- coming musicians. Let’s say they’re primed for the next Coachella. Project Team: David Galullo; Sarah Devine; Sam Farhang; Daniela Covarrubias; Ashley Cocilovo; Keith Muller; Matt Azen: Rapt Studio. Oculus Light Studio: Lighting Consultant. Englekirk Structural Engineers: Structural Engineer. Newson Brown Acoustics: Acoustical Engineer. Arc Engineering: Mep. Seeley Brothers: Woodwork. 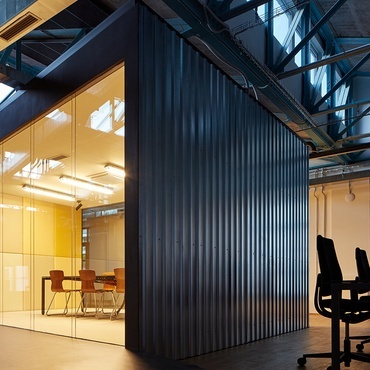 Howard Building Corporation: General Contractor.